The fact that I’m listening to Bruce Springsteen at this point in my life comes as quite a surprise even to me. Let me first say that I go way back to the mid-70’s with The Boss. He was a fireball back then, and a favorite of WNEW FM, a freeform station in NYC that shaped my listening habits in suburban Edison, New Jersey. Among my high school friends, I was the taste-maker — Prometheus of the tape deck and turntables. I was the guy who knew when concert tickets were going on sale and who had a new record coming out. Around ’75, WNEW started to play the album “Born To Run” by this guy Springsteen, who wasn’t from exotic places like England or California, or some big city, This guy was mythologizing my home state of New Jersey. He was telling the world (and me) that there was romance and adventure on the boardwalk of gritty Asbury Park and “somewhere in the swamps of Jersey.” I’d been listening to a lot of what was called “art rock” at the time: Yes, Genesis, King Crimson. I was at the end of my Queen phase and Sabbath was not for me without Ozzy. Bowie’s new direction into crooning was lost on my teenage ears. Led Zeppelin was putting out some tough to swallow records like the bloated “Physical “Graffiti” and the non-event release of “Presence”. And The Stones were floundering. But this guy Springsteen was fresh, compelling. He wore a leather jacket — like the older guys in our neighborhood. He didn’t sing like a girl, like Robert Plant, Jagger, Jon Anderson or Freddie Mercury, he sang like a man. He sang like a man from our corner of the world. He sang about real subjects in real life — not castles, time travel, Bohemian Rhapsodies, Kashmir, or trolls. This guy was one of us. I used to deal in tickets as a way to earn extra money in high school. One of the shows I speculated on was Springsteen and the E Street Band playing five nights or something at (I could be wrong about the venue) the Beacon Theater in NYC. I made enough money that night to buy my first car, albeit a used 1970 Skylark. By 1977, Bruce was no match for the raw power of The Clash, the insanity of The Ramones, the cleverness of Costello. It was punk rock that captured my imagination and shaped my art school years, but Springsteen had been a powerful force in my teens. I’d jumped ship for a wilder ride with the punks and new wave bands. I can remember being at a party and taking “the River” album off the turntable in mid-song and replacing it with Johnny Thunders. Several years later, “Born In The USA” and “Dancing In The Dark” were so musically distant from my interest, I wondered what it was I used to like about The Boss. But I haven’t spent my entire adult life Springsteen-free. I was impressed enough to buy “Tunnel of Love” in 1988. I was deeply touched hearing “The Rising” after the horror of 9-11. And in 2004, while driving cross-country to move back to New Jersey from L.A., my future wife, Judie and I, listened to “Born To Run.” We’d bought a home in Red Bank, and after unpacking the car and getting the house in order, Judie was dead-to-the-world asleep. So I decided to walk into town and explore. I found Jack’s Music, the record store in Kevin Smith’s “Chasing Amy.” And there he was…. Bruce Springsteen himself. His wife Patty was promoting her new record, and there was Bruce in the supporting role, hanging out with fans. On my first night in my new town, in my old state, there was the hero of my car’s tape deck from so many years ago. I opted not to bother him with a handshake or some other intrusion. Besides, what would I say to him? Something awkward like: I used to really love your music, but as my tastes matured, I opted to listen to more artistically daring performers. Iâ€™m really not into mainstream music.” Instead, I walked back to my new home, and thought of my old high school friends whom I had listened to Springsteen with — some of whom had long left this Earth. I thought about how we used to blast “Jungle Land” and “Thunder Road” as we hurtled down the Garden State Parkway on our way to Seaside Heights. Two week’s ago, my wife volunteered at a huge Monmouth County SPCA benefit at the home of E Street drummer and Conan O’Brien bandleader Max Weinberg. Judie had spent months shaking down an impressive amount of local merchants, record company connections, and other businesses for items or services to be auctioned at the event. the evening’s highlight was a thirty minute performance by Bruce Springsteen. She’s been listening to his new record “Magic” ever since. Springsteen offered the single “Radio Nowhere” on iTunes for free several weeks ago. I thought it was a really good rock tune. But after Judie bought the entire record, I thought I should at least give it a try. My conclusion? I’d say it was his best effort in years. While most rockers peak early, and coast on their hits for the next 20 to 30 years, Bruce continues to move forward, and make music worth listening to. He’s somehow more relevant now than ever. He’s speaking out against the war, against the erosion of the Constitution. His songs have a sense of urgency. So with Magic, I’ve come full circle. I’m a fan again. I hear his music in the bagel shop in the morning, in the super market in the evening. It’s in the air in these parts, along with the salty ocean breeze. Turns out he lives less than two miles up the road from me. 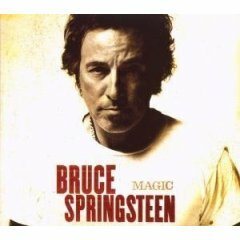 With Magic, I feel I really am home, and realized that though I may have strayed, Bruce Springsteen was always here for me.